DJ’s began making boudin in a local meat market with the family recipe of, Daniel Joseph Bouillon, from Abbeville, Louisiana. As our popularity increased, we opened a commercial processing facility in Beaumont, TX in 1985. We decided to name our company DJ’s Boudain, Inc., after Daniel Joseph Bouillon and Daisy Jewel Wiggins. Mrs. Wiggins, the mother of the owner Linda Morris, is from Oakdale Louisiana. We have been making Boudain from our family recipe for over 30 years now. We’ve come a long way since our humble beginnings in a local meat market. The kettles may have gotten bigger over the years but one thing that hasn’t changed is our commitment to making the best Boudain we possibly can. Along with a lot “TLC” we continue to use only lean pork, fresh produce, and locally grown rice to go in our Boudain. 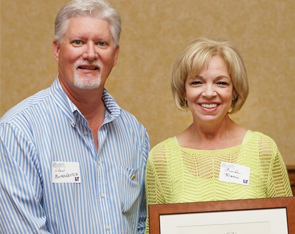 We believe that a commitment to excellence in what we do is the best way to reward our loyal customers. The Southeast Texas area of Beaumont – Port Arthur – Orange has as much Louisiana and Cajun history as it does with the Lone Star State and Texan boots; a match made in Heaven’s kitchen for our family and yours. 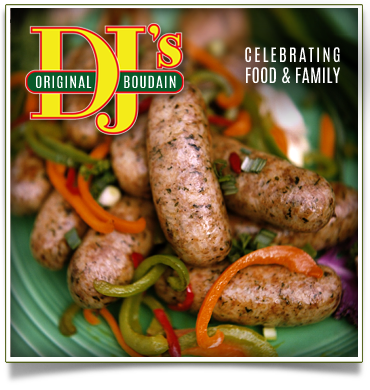 The iconic taste of DJ’s boudin was awesome, so we added the “a” to the spelling. Simply put we wanted to show our originality and let folks know it not just boudin when it comes from DJ’s. DJ’s Boudain quickly gained a loyal following. In 1992 we began construction on a new production facility and purchased additional equipment to keep the quality our customers deserve and expect. Soon our Rice Dressing and Boudain Balls became a hot, zesty and smile-inducing commodity alongside our boudain links. Thanks to our customers continued support we expanded for the third time in 2012. We have been blessed with many employees that have worked and believed in our product for 20 plus years. Needing additions to our DJ’s team, we welcomed the second generation members of our families to the business! Our company is growing by leaps and bounds, but our values stay as true as our original recipe. We believe when you’re truly committed to excellence in anything you do, then only good things can come of it. We’re honored and blessed to play a role in families’ meals and traditions, and we look forward to achieving excellence with the two things closest to our hearts: food and family. 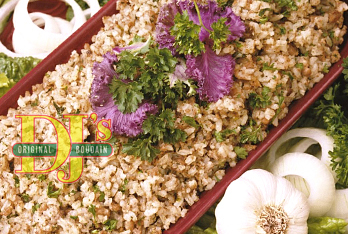 Recipes are endless with Boudain and Rice Dressing from DJ’s. We are fortunate that our customers send in recipes and ideas. Creative ones, wild ones, and even the simple-but-sensational recipes show just how versatile our boudain is around foodies. Boudain can be microwaved, steamed or grilled and served with breakfast lunch and dinner. Poached eggs, scrambled eggs, or fried eggs on a dollop of DJ’s Rice Dressing or Boudain really makes breakfast the most innovative meal of the day. Boudin is also being served in kolaches and breakfast pizzas in area restaurants. You can microwave or steam our product for a quick and easy lunch. 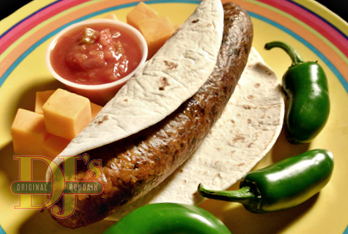 Heat the Boudain link, place on a bun or tortilla; add a shot of mustard for a little zest. Boudin served with crackers and a salad is another great lunch. Have I told you about the benefits of adding Sriracha hot chili sauce? Fried crispy Boudain Balls are always a great hit as a snack or appetizer. They pair well with seafood, barbeque, and anything else that makes you say YUMMM! Boudain dip is extremely popular at parties, weddings and family reunions. Mix DJ’s Rice Dressing with Tostito’s Chile con queso, microwave and serve with tortilla chips and you will wonder how you ever entertained without this dish! For a cold dip just add cream cheese and sour cream with DJ’s Rice dressing and serve with crackers. Because of our commitment to quality, today DJ's Boudain, Inc. is among the top in sales throughout our long-term service area, and we are able to develop new and exciting products to be introduced. Even with our success and expansion, DJ's Boudain, Inc. continues to be dedicated to the quality that has made our company what it is today. We have an USDA inspector officed here at our plant in Beaumont, Tx.